Frontier Airlines is one of the major low cost airline of USA with its base in Denver, Colorado, United States. Frontier Airlines provides air flight services to different destinations of United States, Mexico, and Canada. Following the code share agreement with Great Lakes Airlines, Frontier operates regional destinations services from Rocky Mountain States. Avail booking of Frontier Airlines flights tickets reservations here through online procedure. Frontier Airlines Schedules are also updated online. Cheap flight tickets for Frontier Airlines are also available online. Frontier Airlines was founded in 1994 and started operations with Boeing 737 aircraft. A partnership agreement was signed between Frontier Airlines and AirTran Airways. 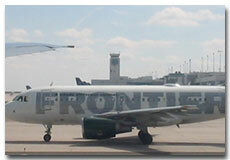 In 2007, United States Department of Transportation declared Frontier as a major carrier.